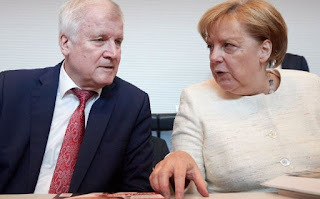 Mr Seehofer has been a long-standing critic of that open-door policy, which was summed up at the time by Mrs Merkel's phrase "we can manage". He says German border police should turn back all asylum seekers who lack ID and those already registered in another EU country. Mrs Merkel sees that as a "go-it-alone" policy which would further hurt Italy and Greece, countries whose capacity to house migrants is stretched to breaking point. Among them are many refugees from the Syria war and other conflict zones.